SECRETS OF A SOCCER MOM opens Friday, March 22, 2019 and runs through Sunday, April 14, 2018. Performances are Thursdays, Fridays and Saturdays at 8pm, and Sundays at 2:30 pm. Approximately one block South of Mt. Vernon Rd and Chamblee Dunwoody Road in the North Dekalb Cultural Arts Center. Tickets start at $33; senior, student, and youth discounts are available. Who knows what secrets lie in the hearts of soccer moms? STAGE DOOR PLAYERS, takes a crack at answering that question as their Sapphire Season of celebration continues. 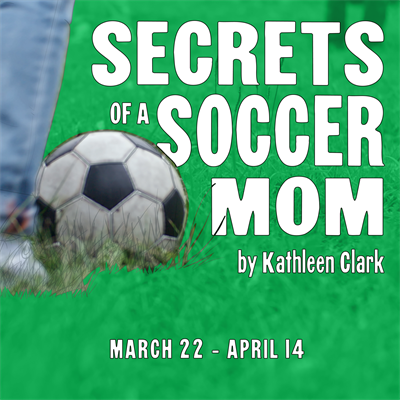 Kathleen Clark’s SECRETS OF A SOCCER MOM takes a look at a mother’s struggles to be herself while still raising a family, balancing her own needs versus the needs of her kids, against the competitive backdrop of a mom vs. sons soccer match. The show opens on Friday, March 22 and runs through Sunday, April 14, 2019. Performances are Thursdays, Fridays and Saturdays at 8pm, and Sundays at 2:30 pm. Single tickets are on sale now at the box office (770-396-1726), or online at www.stagedoorplayers.net. Tickets are $33; senior, student, and youth discounts are available. Three engaging women reluctantly take the field in a mothers vs. sons soccer game. They intend to let the children win, but as the game unfolds they become intent on scoring. The competition ignites a fierce desire to recapture their youthful good-humor, independence and sexiness, paving the way toward a better understanding of themselves, their families and changes they need to make in their lives.